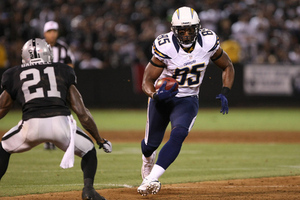 If you drafted Antonio Gates this year, you know exactly what I mean. His stats thru three games have been pathetic- 7 recs, 65 yards, ZERO TD. This week up for Gates and the Chargers, Kansas City. He has accumulated 16 grabs for 267 yards and three touchdowns in the three games prior against the Chiefs. It’s now or never, A Gates.